The role of the architect today is to awaken a sense of wonder in the environment we live in, to question how people dwell together and, ultimately, to improve our habitat through creative thinking, innovation design and building techniques. 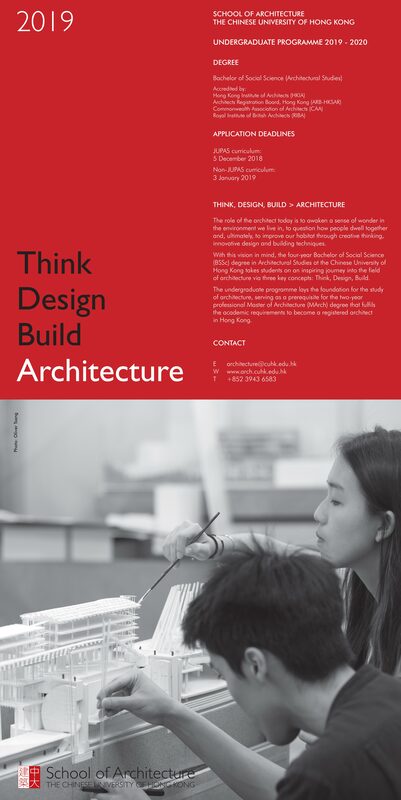 With this vision in mind, the four-year Bachelor of Social Science (BSSc) degree in Architectural Studies at the Chinese University of Hong Kong takes students on an inspiring journey into the field of architecture via three key concepts: Think, Design, Build. 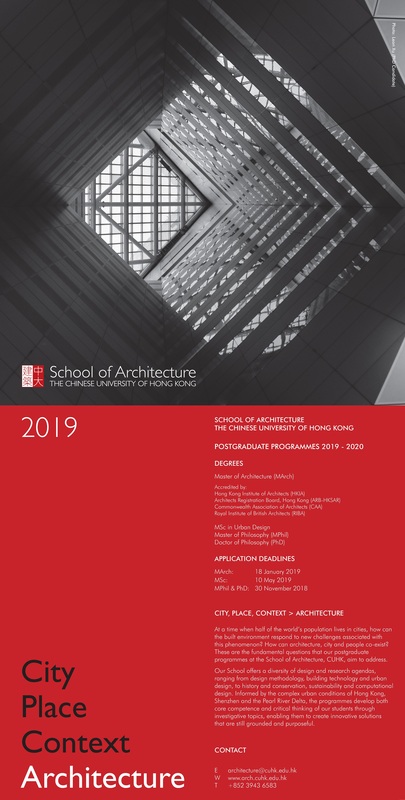 The undergraduate programme lays the foundation for the study of architecture, serving as a prerequisite for the two-year professional Master of Architecture (MArch) degree that fulfils the academic requirements to become a registered architect in Hong Kong. At a time when half of the world’s population lives in cities, how can the built environment respond to new challenges associated with this phenomenon? How can architecture, city and people co-exist? 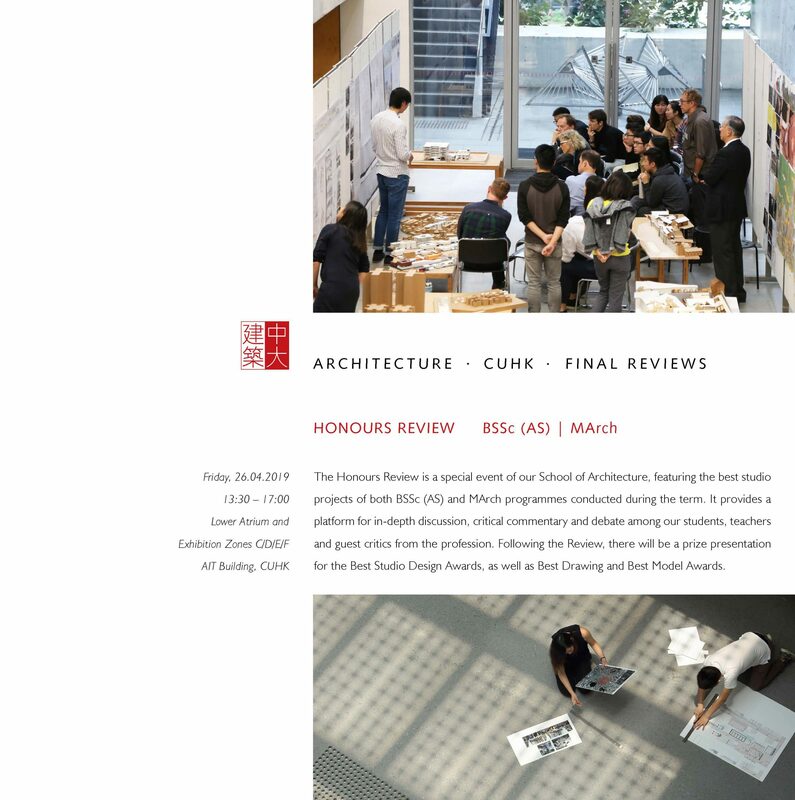 These are the fundamental questions that our postgraduate programmes at the School of Architecture, the Chinese University of Hong Kong, aim to address. Our School offers a diversity of design and research agendas, ranging from design methodology, building technology and urban design, to history and conservation, sustainability and computational design. Informed by the complex urban conditions of Hong Kong, Shenzhen and the Pearl River Delta, the programmes develop both core competence and critical thinking of our students through investigative topics, enabling them to create innovative solutions that are still grounded and purposeful.